Sometimes you might want to play a game, but there isn't anyone else around the play with. Don't worry, though, there are plenty of games that you can play by yourself. These games are not expensive, as they can be played with a standard deck of playing cards. Some solitaire card games have scoring systems, while others require a task to be completed to win. The game of golf is a solitaire card game variation where the goal is to remove all of the cards from the playing area. The game starts by dealing five columns of cards, with each card overlapping the next so the number and rank of the card underneath it can be viewed. To start the game, flip over the top card of the draw deck. You may play any card on your five columns that isn't covered onto the face-up card you flipped over, as long as it's one rank higher or lower than that card. Continue playing until you can't play another card from the columns onto the card played last. Cards may not be played on top of a king. 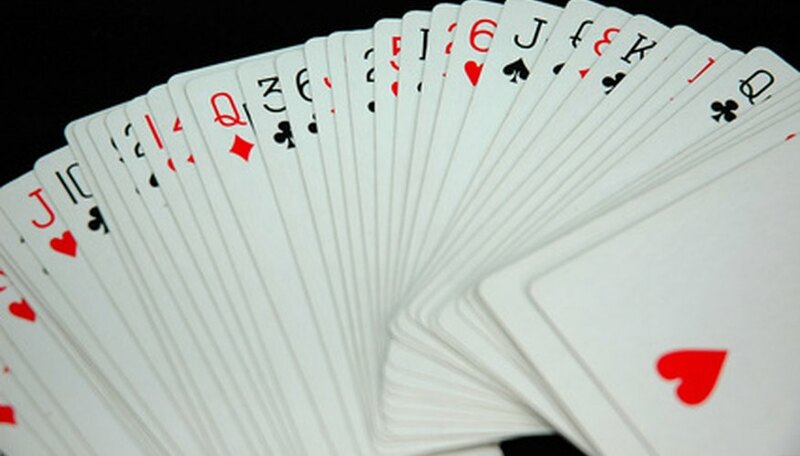 Aces, too, are the lowest card in the deck. Should these surface, flip a new face up card on top of the pile. Monte Carlo is a game where you try to remove pairs of cards from a five-by-five grid of cards you deal. Start by dealing 25 cards, in five rows of five cards each. The cards must be placed in order, filling out the first row left to right, and each additional row in order in the same way. Remove any cards with the same rank, as long as they share an edge or corner that touches each other. Once you've removed the matches, shift remaining cards one space to the left and up to the next row when necessary to fill in empty spaces. Continue until all cards have been dealt. In poker square, you place cards one at a time on a five-by-five grid. The goal is to make the best poker hands you can to receive as high a score as you can. Once you have placed all 25 of your cards into the grid, you score your hand. Scoring is done for rows, columns, and diagonals with five cards in them. Hands with a pair are worth one point. Hands with two pairs or three of a kind are worth two points. Three points are awarded for straights and flushes. Full houses score four points. A straight flush or four of a kind is worth five points, while a royal flush scores the highest point total of 10 points. Add the points for each of your rows, columns and diagonals together to determine your final score.